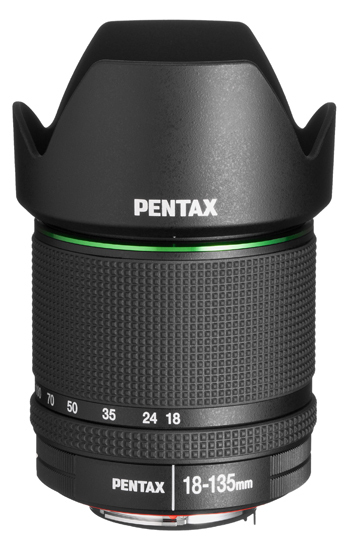 Pentax is to introduce a new weather-proof zoom lens to join the weather resistant K-5 DSLR. Featuring an Extra-low Dispersion element, and a hybrid aspheric and a glass moulded aspheric, the ?compact and lightweight? smc-Pentax DA 18-135mm f/3.5-5.6ED AL IF DC WR has a weather-proof construction and forms a seal against rain when fitted onto a weather resistant camera ? such as the K-5. The lens has its own DC motor to enhance AF speed, and when used in AF modes this combined with internal focusing system means that the AF ring and the forward element do not rotate. Designed for use on Pentax digital SLR cameras the focal range will perform as a 27-207mm on a full frame camera. The lens is only suitable for APS-C sensors and will not cover a frame of film without vignetting. The lens is set to go on sale in early November, priced around £599.99.